Earlier today (sorry – I’m writing these up as fast as my fingers will go! 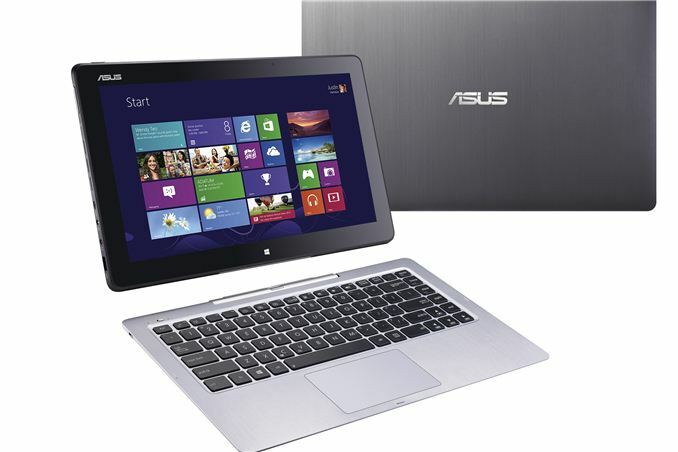 ), ASUS announced their new Transformer Book Trio, a hybrid Android + Windows 8 tablet/laptop. We’re busy covering a bunch of their IFA announcements, but some of the first comments on the Trio are, “Why can’t ASUS just give us a Windows 8 tablet and forget Android?” The Transformer Book T300 does exactly that, though you can expect battery life to take a hit relative to the Android mode of the Trio, and the screen is a somewhat large for a tablet 13.3”. The good news is that other than size, you get a rather potent tablet/hybrid computer. The CPU options consist of the i3-4010U (1.7GHz), i5-4200U (1.6-2.6GHz), and the i7-4500U (1.8-3.0GHz), with Intel’s HD Graphics 4400 handling graphics duties. Even better, the display is a 13.3” 1080p IPS panel with 10-point capacitive multitouch. ASUS also notes that their display senses a 6mm contact point instead of 9mm, providing greater precision. Memory is listed as “up to 8GB”, which likely means there will be a low-end Core i3 model with 4GB and the higher end models will come with 8GB soldered onboard. Storage is pure SSD, using the NGFF/M.2 standard and supporting 64/128/256GB options. Other features include a rear 1080p camera and front 720p camera – and I can’t wait to see someone trying to record video or take pictures with a 13.3” tablet! (Seriously, other than children, does anyone use the rear-facing camera on their 10” and larger tablets? I know I don’t.) Connectivity consists of 802.11n (ASUS doesn’t mention whether it’s dual-band or not, so I’m guessing not), USB 3.0, micro-HDMI 1.4, microSD, and 3.5mm headphone/mic. The dock adds an additional micro-USB 3.0 port. Interestingly, it appears the T300 dock does not include any additional battery capacity. ASUS rates the battery life at up to 8 hours with the included 6710 mAh lithium polymer battery, but there’s no comment on additional battery life when docked, which is a shame. The dock does include backlit keys and a large multitouch touchpad, however, with full size keys. The tablet half of the T300 measures 342mm x 216mm x 11.5mm and weighs 1.1kg, and the keyboard dock measures 340mm x 216mm x 11mm and adds 800g. Combined, you get something that’s nearly an Ultrabook, with the option to detach and take the tablet with you as you see fit. As is the case with all the other ASUS announcements today, pricing and availability have not been finalized, but I expect we’ll see all of these new devices in time for the holidays. I’d also expect something like the T300 with Core i5 and a 128GB SSD to come in closer to the $1000 price point, though I’d love to be surprised and see it below $800, as that’s where it becomes truly able to displace high-end Android and iOS devices. I have a Vaio Pro 13 and I really love the absurdly low weight. That said, the materials are definitely in line with previous Vaios. The chassis has a ton of flex. I don't find it worrisome--it never feels like it's in danger of breaking--but it is bad enough that I can click the touchpad just by squeezing on either side of it (though Windows doesn't register the click if you don't have a finger on it, thankfully). They also didn't manage to make the laptop openable with one hand, which is annoying. Seems to me the problem is that you need most of that weight in the tablet part, so you need to balance that weight in the dock if you want the combination to be a remotely useful laptop, unless you go the Surface route (i.e. built-in stand). Of course, that raises the obvious question of "who actually thinks a 13" tablet is a good idea?" I certainly don't. I would have loved a detachable 13" tablet in college. I had a 12.5" Lenovo X230T convertible which is the kind where the screen swivels around and folds back down outwards. I used it in two modes: 1) laptop with touch screen for tapping and scrolling, and 2) notebook tablet. yeah, I just bought a Fujitsu stylistic q702 because I wanted at least a battery in the keyboard dock. even if you don't care about the storage and battery, you need some weight in the dock to keep it from falling over backward when touched or leaned back.